With her penchant for billowy slipdresses and pastel pink locks—at least for the moment—Jessica Louise Dye is the embodiment of NYC’s lower east side, rocker cool girl. 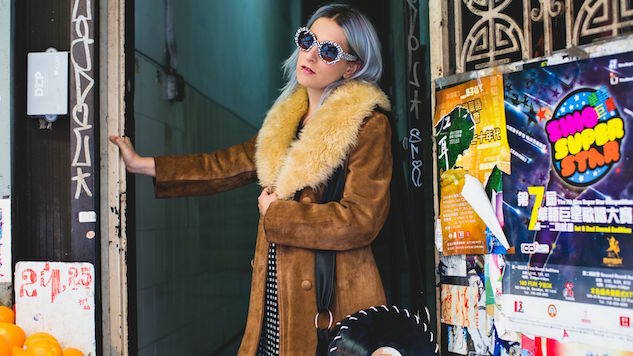 Frontwoman for High Waisted, Dye describes her look as vintage-inspired and does throwback styling oh-so right, making yesterday’s looks her perfect go-tos for today. Steeped in grunge but softened by feminine staples and a devious mystery, Dye’s allure, much like the band’s sound, were made for late-night New York City adventures. Described as surf rock and dream pop, High Waisted’s sound has a twangy, low-fi approachability while Dye’s purred lyrics range anywhere from silky crooner to roaring party starter. Hits like “Shanghai Spy” and “Party in the Back” display the band’s driving guitar harmonies, bright drum hits and fuzzy bass while softer songs like “Door” hint at Dye’s vulnerable interior. Overall, High Waisted’s charm lies in their wild child vibe and beachy riffs juxtaposed by the hard edges of an east coast sensibility. Though High Waisted plays the carefree card, do not be fooled by the easy-going reverb. Dye and company play with a layered intensity and beguiling harmony while Dye’s intense vocal range, from pithy babydoll to a waning snarl, coos the audience into a dance party frenzy every time. Much like her self-imposed dresscode, Dye’s sound is a luxurious mélange of femininity teased out with neon lipstick, black knee highs and platform boots made for stage dives and all-night “get downs,” as she calls them. With their debut album On Ludlow hitting the shelves today, March 4, and an east coast tour on the books in April, High Waisted is primed and ready to take on the world, one surf anthem at a time. In between all the hullabaloo, we were able to catch up with Dye via email to get the scoop on her vintage style and why the 1960s have a special place in her heart. Paste: Tell us a little bit about your style and how it influences you and your performance on stage. Jessica Louise Dye: I love mixing feminine pieces with beat up leather or fishnets. I don’t wear pants, ever. My closet consists of only dresses, skirts and a few crop tops. Comfort and and flirtiness are very important to me. I love when my skirt has a little swing to dance with. I also prefer modest tops on stage so I can bounce around with the boys and jump into the crowd without any embarrassing wardrobe malfunctions. Paste: What do you think makes up an ideal stage outfit? Dye: My go to look consists of a leather jacket, mini dress, over the knee socks and platform boots. I’m pretty uniform and like to play with prints and colors. Paste: How would you say your on-stage style differs from your off-stage style? Dye: Shorter dresses, taller shoes, thicker eyeliner, bigger hair. But it’s really just a slightly more exaggerated version of my day to day look! Paste: How has your style changed since you first started performing? Dye: Recently, I have been more era specific with my styling. I’m really only dressing with pieces from the 60s and 70s, which also reflect the sound of my band. Dye: Diana Ross, Jane Birkin, Cher, Blondie, Nancy Sinatra, The Supremes and Brigitte Bardot. Paste: The look of your music video “Party in the Back” is all over the place from skater kid to disco queen. Did you have a hand in the styling or was the idea more a come as you are type vibe? Dye:I concepted and directed the entire video with my drummer, Jono Bernstein. We wanted to give viewers a glimpse into a typical night out in the lower east side. We were styled in looks from our own wardrobes for the beginning of the video. The second half of the video, or the acid dream as I call it, was a glamorous disco, girls only, dancing, drinking, get down party. We wanted it to feel like a modern Studio 54. I worked with designer, Jamie McCarty, to custom create all of the costumes. The color palette and styling was very deliberate to help take viewers on a candescent acid trip. Paste: Any favorite places to shop or find one of a kind wardrobe pieces? Dye: I thrift often, but only outside of NYC. I also do a lot of eBay hunting and throw seasonal clothing swaps with my girlfriends. Paste: If you could live and dress in one specific era, which would you choose? Dye: I already dress as though it’s 1963. So, I’d love to teleport to NYC in the 70s and dress like Cher! Dye: I put leftover hair dye in my conditioner to keep my pastel color fresh! Paste: If you had to sum up your personal style in three words, what would they be?